The BoBunny Blog: A Merry Misc Me Christmas! A Merry Misc Me Christmas! Welcome to another day of inspiration with BoBunny and Leaky Shed chipboard. When I looked at my stash with photos, I noticed that I still had quite a lot of Christmas and winter photos from last year that I hadn't scrapped yet. Since I didn't want to create a separate lay-out for each photo, I decided to record them in my Misc Me life journal. I just love this BoBunny journal system and it enabled me to create a pretty documentation of my Christmas photos and memories. 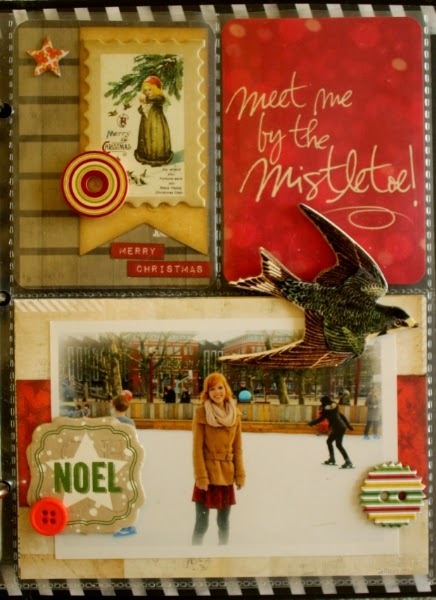 For my Misc Me pages, I used a combination of the Candy Cane Lane Misc Me cards and the Christmas Collage collection. Some of the Candy Cane Lane cards had a vintage look that matched the Christmas Collage collection just perfectly. On my second page I incorporated a beautiful corner flourish from Leaky Shed. At first, I wanted to cover it in glitter or heat emboss it, but in the end I decided to keep it natural. 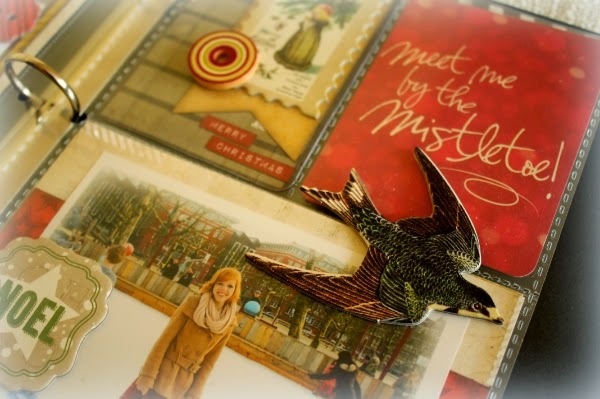 The brown tone of the flourish actually matched the vintage colours in the Christmas Collage collection quite well. 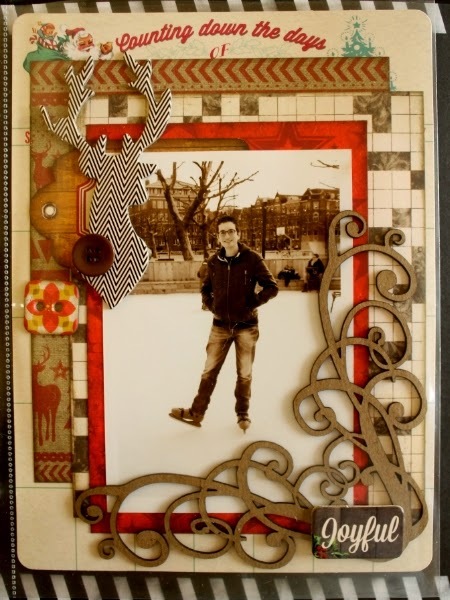 I used the chipboard embellishments and buttons from the Christmas Collage collection to further embellish my pages. As you can see on the photo above, I added some of the embellishments on the page itself (inside the sleeves) and some of them on top of the sleeves. This allowed me to incorporate as many layers as I wanted. On the page above, I used the Christmas tree from Leaky Shed. Again, I didn't decorate it with any mediums, but just kept it as it was. 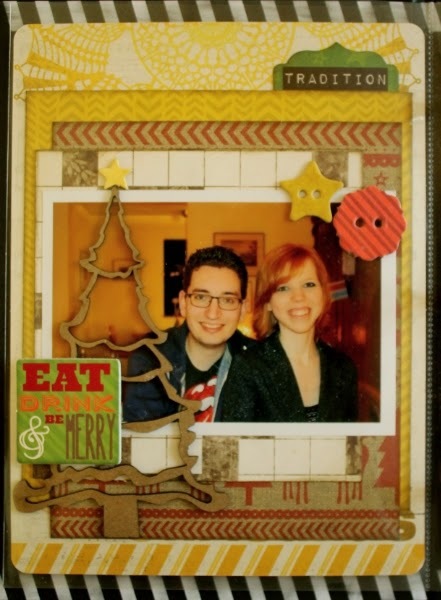 I loved the chipboard piece with the text "Eat, Drink & Be Merry" as it suited the photo of me and my boyfriend just perfectly. It was taken at Christmas dinner last year and represents just how we felt at that moment. A few days before Christmas, my boyfriend taught me how to ice skate. I hadn't skated for at least 7 years and was pretty afraid to start doing it again, but it turned out that I actually wasn't as bad as I expected to be. We had a wonderful time. I scrapped this photo in my Misc Me December pages as well. 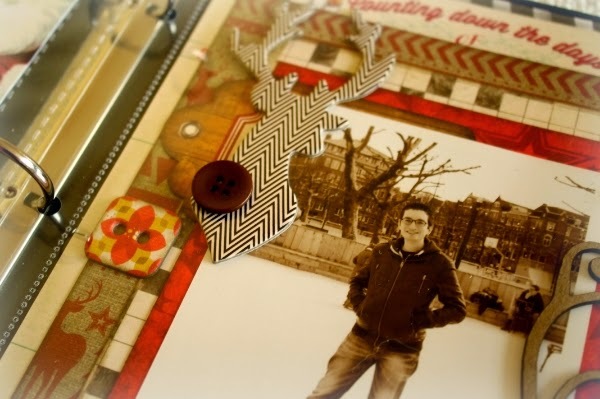 As you can see on the photo above, I used some of the pre-made Candy Cane Lane journal cards, but also hand-cut a few cards from the Christmas Collage papers. What a lovely way to remember Christmas, with this beautiful collection. Such beautiful pages! I really like the vintage Santa on the first page...brings back lots of childhood memories! The colours are perfect with your photos! Got to get back to scrapping instead of so many cards. Bo Bunny paper is a great way to start. The chipboard adds so much dimension! Love it! Very pretty collection. Thanks for the chance to win it! Love all your products! Very pretty!